An image of Omran Daqneesh, dusty and bloodied in the back of an ambulance, did not suffer grave injuries from Syrian government forces, after all — in fact, the whole story was an elaborate lie. Covered in dust and bruises with hair disheveled from having survived a blast, the blood beginning to crust over half his face, a seeming placidity — hands anchored on his legs, all-but unmoving — could not mask the stoic trauma in little Omran Daqneesh’s eyes. Gazing hauntingly from the back of an ambulance in Aleppo in August 2016, Omran’s image snared the heartstrings of the world — even those previously hardened to the hopelessly tangled morass in Syria — transmogrifying into a single human form the suffering of innocent Syrians at the whims of entire nation-states embroiled in proxy war upon war in the name of political squabbles. But, while the West took up Omran’s cause, Westerners did so under the pretense the child had been bloodied by an airstrike or missile launched by the forces of Syrian President Bashar al-Assad or their allies from Russia — his image rekindling the fire of contention propaganda designed to support the United States’ goal of regime change. 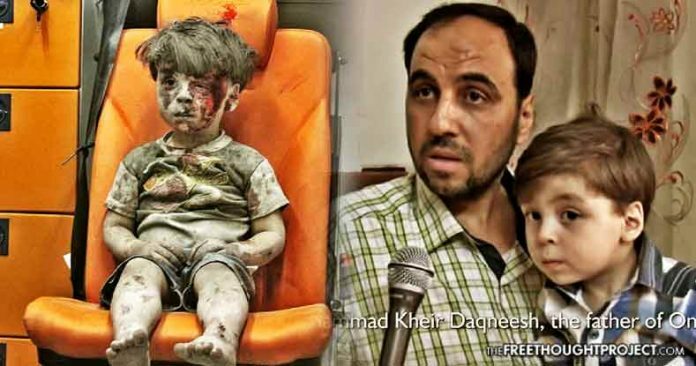 But it was a lie — from mass media’s parroted claims the boy had escaped an airstrike within an inch of his life, to bandages eventually wrapped around Omran’s head — virtually none of the narrative stemming from the starkly persistent image bore the weight of truth.